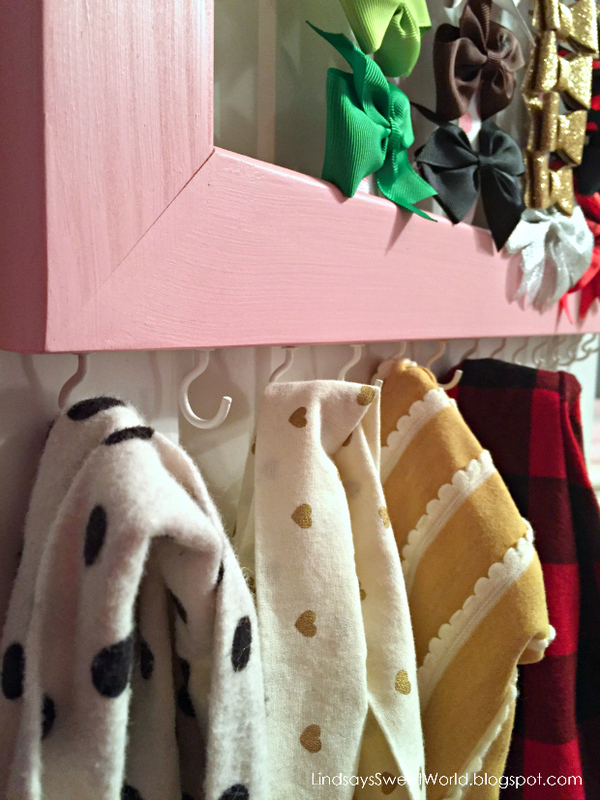 The other day while cleaning out Olivia’s newborn bows (and maybe tearing up over the fact that I no longer have a baby), I realized that this would be the perfect little project to share on the blog. 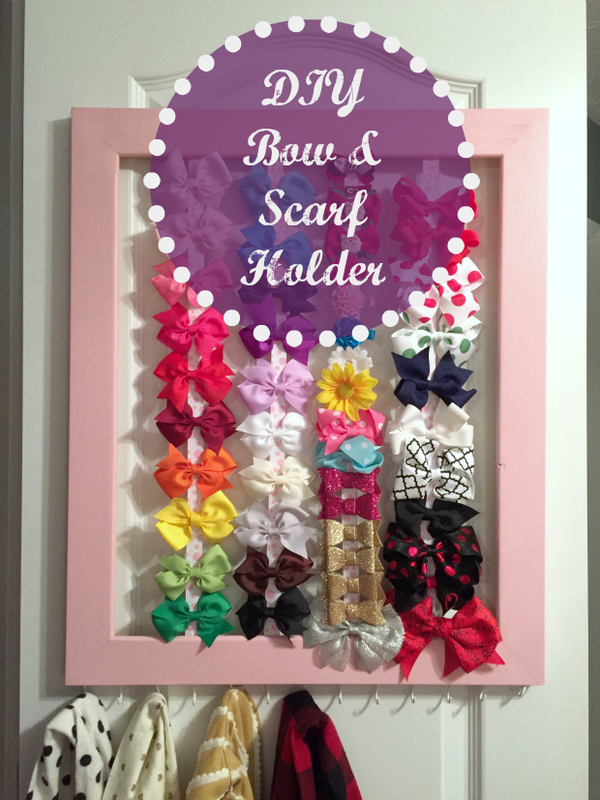 These are so quick and easy to make, and if you have a little girl, I promise one day you will want one to wrangle all of those bows. They really add up quickly! I actually made this one before Olivia was born, and that was also before I had this little blog of mine, so unfortunately I don’t have pictures of the materials pre-project or pictures of the steps that I took along the way. However, this project is so simple that you probably don’t even need the step by step pictures as the instructions I’m going to provide should suffice. Paint or stain the frame to your liking. I had some leftover pink paint that I used for Olivia’s bookshelf, so I used that. Allow to dry. 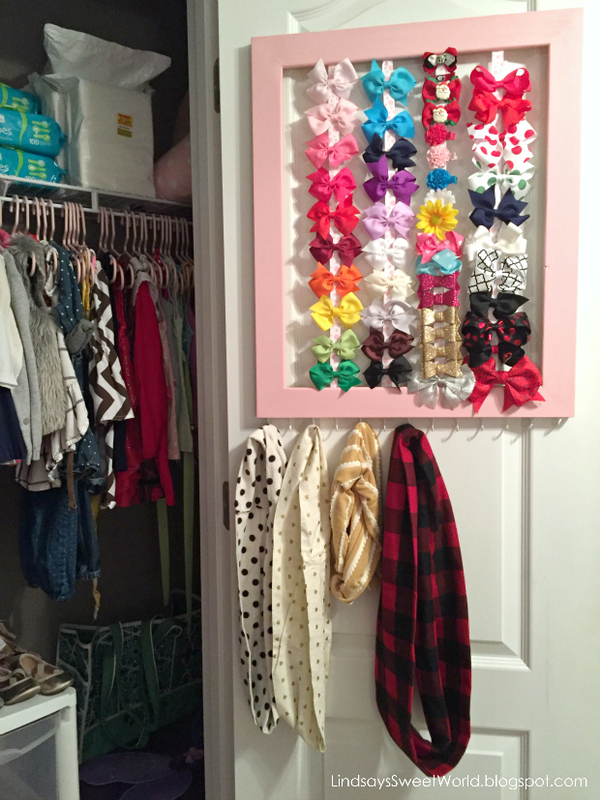 Decide how wide each row needs to be based on the sizes of the bows you are looking to hang. 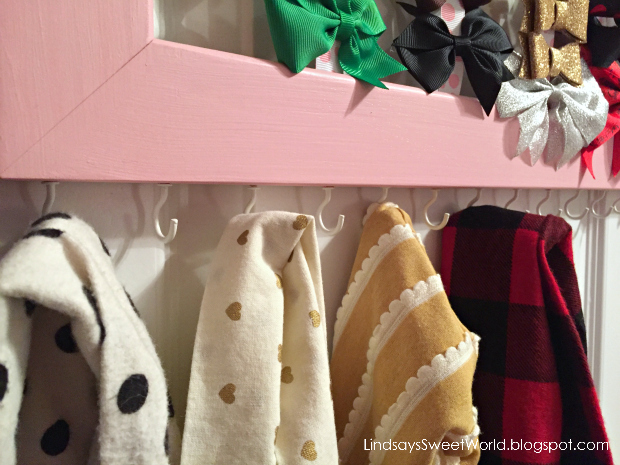 We prefer smaller bows in our house (three inches and smaller), so I knew that each row would need to be around three inches wide. This allowed for four rows of ribbon on my frame. Flip the frame face down. Using your ruler, mark the top and bottom of the frame where you would like to staple the ribbon. I wanted evenly spaced rows, so I marked my spots accordingly. 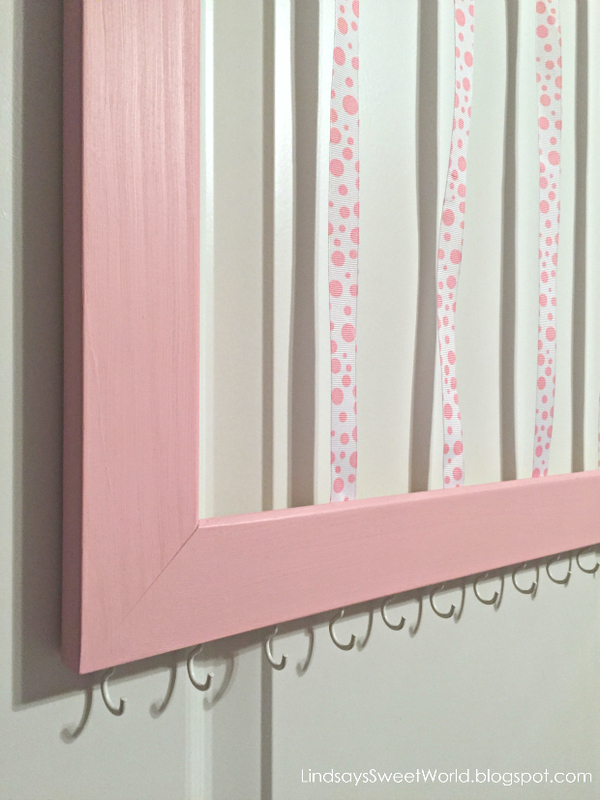 Using your ruler, mark the spots evenly spaced across the bottom border of the frame where you would like to screw in your c-hooks. Screw the c-hooks into the holes you just drilled taking care to face all hooks out toward the front of the frame. 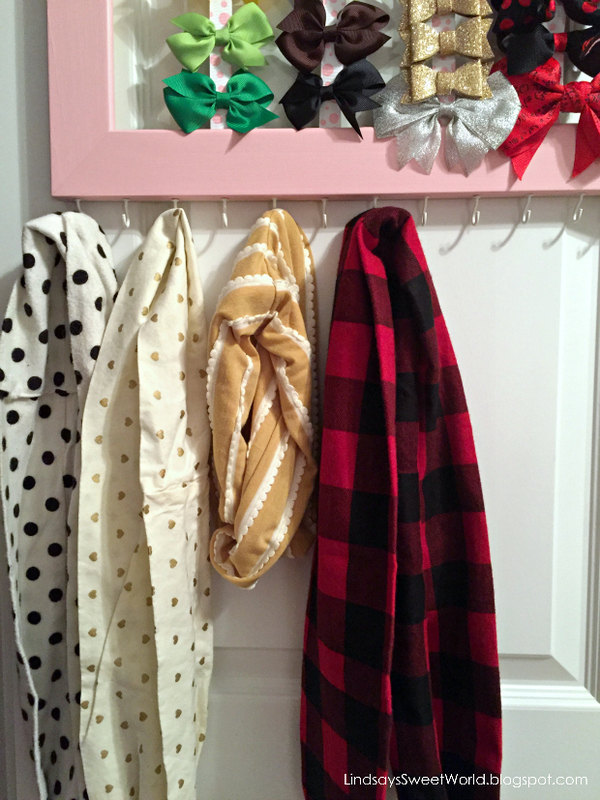 These will be your hooks to hang scarves (or headbands or elastics or whatever you’d like). Cut your ribbons to size and lay them on the marks that you made in the last step. Staple the ribbon to the back of the frames. 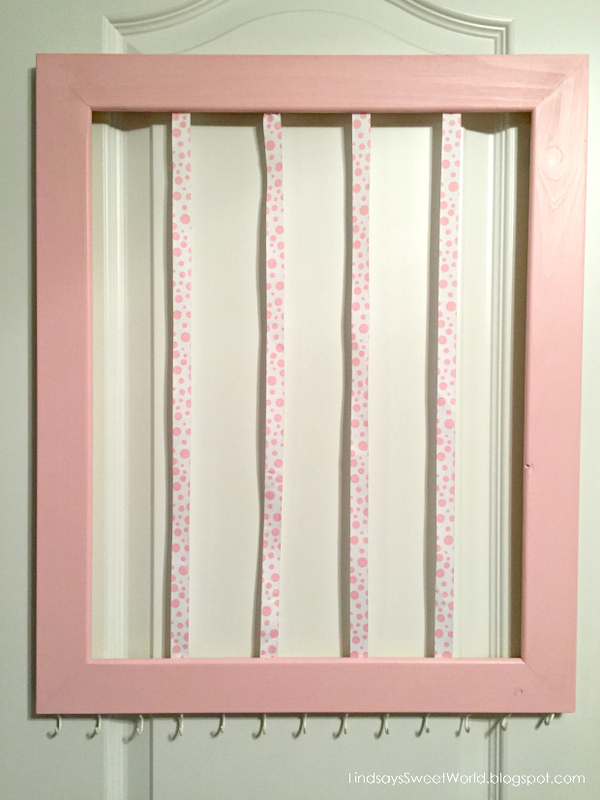 Be sure to face the design on the ribbon face down so it will show when the frame is hung. Also, be sure to stretch the ribbon as tight as you can, otherwise it may sag once you load it up with bows. You’re done! 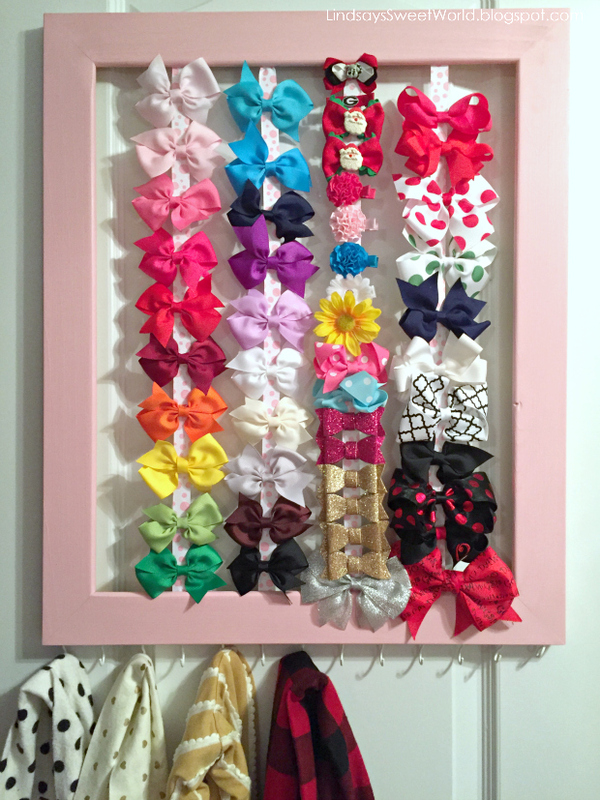 Now arrange all of those pretties on there and just hang it up. Olivia’s walls were already decorated, so there wasn’t a spot in her room to hang it, so I hung it on the inside of her closet door using command strips. Those things are the best evarrrr. *Linking up with Jessi's Design and Going the Distance for What's Hap-Pinning. Yes, please do! I'd love to see how yours turned out! OB-SESSED! I'm literally going to get everything for this in the next week or so! Love! This is such a great project! So handy and cute at the same time. Love it! So cute! 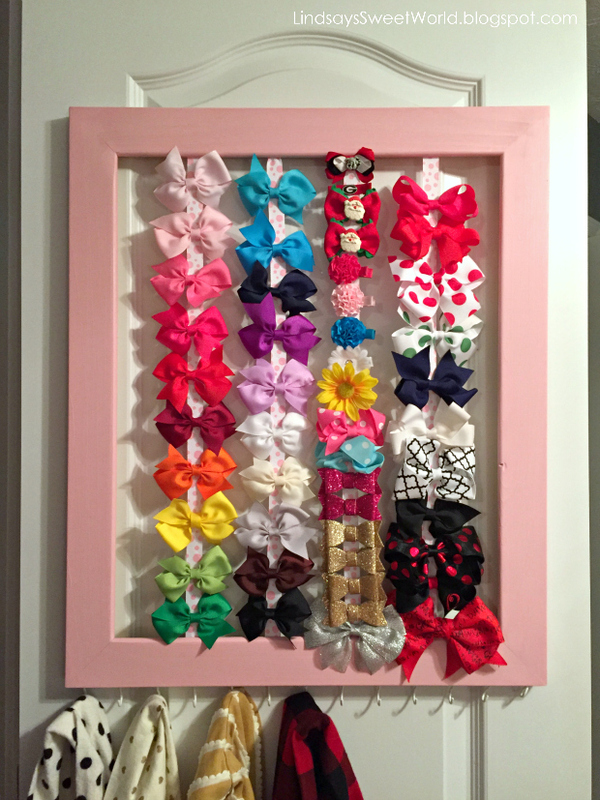 Eliza's bows used to be in a basket and I only, recently, made her a bow holder. Geez, that only took me two years! YIKES! You need to post yours! I would love to see it! definitely saving this! 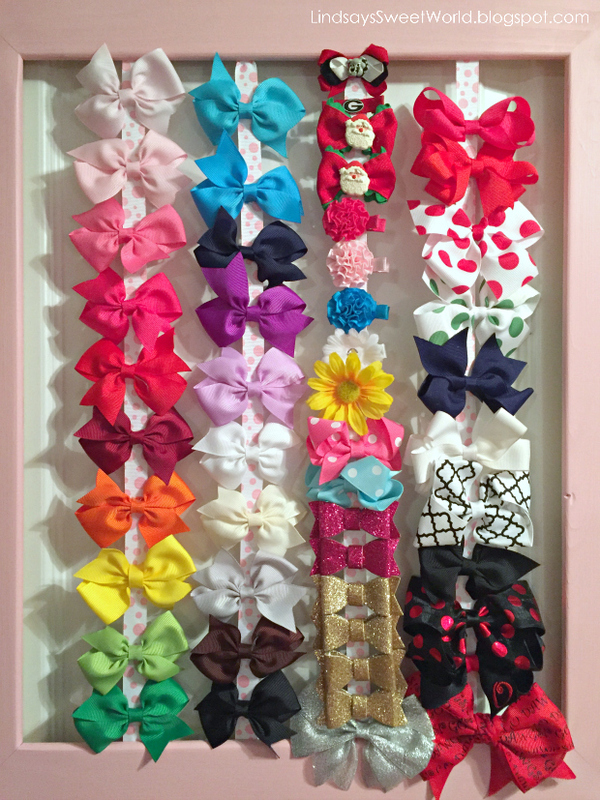 have been needing to make a bow for all of Harpers bows and this is adorable!